Elias of great fame was from Thisbe or Thesbe, a town of Galaad (Gilead), beyond the Jordan. He was of priestly lineage, a man of a solitary and ascetical character, clothed in a mantle of sheep skin, and girded about his loins with a leathern belt. His name is interpreted as "Yah is my God." His zeal for the glory of God was compared to fire, and his speech for teaching and rebuke was likened unto a burning lamp. From this too he received the name Zealot. Therefore, set aflame with such zeal, he sternly reproved the impiety and lawlessness of Ahab and his wife Jezebel. He shut up heaven by means of prayer, and it did not rain for three years and six months. Ravens brought him food for his need when, at God's command, he was hiding by the torrent of Horrath. He multiplied the little flour and oil of the poor widow of Sarephtha of Sidon, who had given him hospitality in her home, and when her son died, he raised him up. He brought down fire from Heaven upon Mount Carmel, and it burned up the sacrifice offered to God before all the people of Israel, that they might know the truth. At the torrent of Kisson, he slew 450 false prophets and priests who worshipped idols and led the people astray. He received food wondrously at the hand of an Angel, and being strengthened by this food he walked for forty days and forty nights. He beheld God on Mount Horeb, as far as this is possible for human nature. He foretold the destruction of the house of Ahab, and the death of his son Ohozias; and as for the two captains of fifty that were sent by the king, he burned them for their punishment, bringing fire down from Heaven. He divided the flow of the Jordan, and he and his disciple Elisseus passed through as it were on dry land; and finally, while speaking with him, Elias was suddenly snatched away by a fiery chariot in the year 895 B.C., and he ascended as though into heaven, whither God most certainly translated him alive, as He did Enoch (Gen. 5:24; IV Kings 2: 11). But from thence also, after seven years, by means of an epistle he reproached Joram, the son of Josaphat, as it is written: "And there came a message in writing to him from Elias the Prophet, saying, Thus saith the Lord God of David thy father, Because thou hast not walked in the way," and so forth (II Chron. 21:12). According to the opinion of the majority of the interpreters, this came to pass either through his disciple Elisseus, or through another Prophet when Elias appeared to them, even as he appeared on Mount Tabor to the disciples of Christ (see Aug. 6). O Prophet and foreseer of the great works of God, O greatly renowned Elias (Elijah), who by your word held back the clouds of rain, intercede for us to the only Loving One. 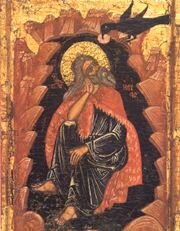 Share the feast of The Glorious Prophet Elias (Elijah) with an icon greeting ecard.